I'm very lucky to be a Casa Loma wedding photographer. Casa Loma Wedding shoot provided such an amazing backdrop for wedding images. This is by far one of the most amazing wedding venues that I have visited. Casa Loma is a historical landmark as one of North America's only castles and offers a one of a kind backdrop for any event. The elegance of Casa Loma begins in the Great Hall, with its impressive 60ft high oak beamed ceiling and 40ft bay window. The main floor also consists of two other unique event spaces; the Library, decorated in a traditional early 1900's elegance, with rich wood finishes and the Conservatory featuring elaborately plastered ceilings, marble flooring, and an Italian stained glass ceiling dome. When planning your wedding reception or wedding ceremony and reception, Casa Loma provides the perfect setting for an evening you will never forget. Enjoy a breathtaking view from The Terrace which overlooks beautiful gardens, sparkling fountains and unusual sculpture. The Gardens are also available for wedding photography. What I really love was the unobstructed light shining through the entire structure, the lush greenery, and the meticulously landscaped gardens make shooting wide-open a real treat and results in some seriously airy photographs. 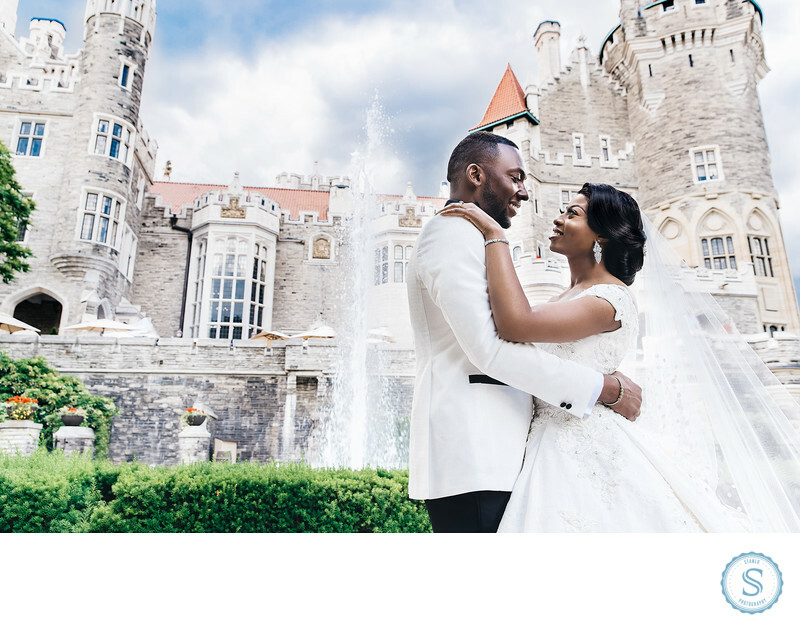 Of course, having a huge castle in the background adds an element of regality so this venue is perfect for couples planning a modern wedding that seeks inspiration from the past. Sam and Sarah made shooting this wedding so easy and a real pleasure. When couples have an inspired vision for their day that not only reflects who they are as people, but also plays off the surroundings available to them– paying attention to the history, the architecture, and the light, it allows us to apply our own artistic creativity to the shoot. The result, as you will see, are images that immortalize all the genuine emotions of the day while respecting the intricate details of the venue, the hard work of all the vendors, and the initial vision created by this unforgettable couple. Location: Casa Loma Toronto Canada. Keywords: African American Wedding Photographer (120), Atlanta Wedding Photographer (348), bahamas wedding photographer (246), black wedding photographer (408), destination wedding photographer (351), miami wedding photographer (423), new york wedding photographer (159), North Carolina Wedding Photographer (120), Santorini Wedding Photographer (120), south florida wedding photographer (192). Filename: Casa Loma Wedding Photographer.jpg. 1/160; f/5.6; ISO 250; 28.0 mm.